The bearded head of St John the Baptist, straight haired and with a moustache, is represented, mouth open, on a dish. Below Christ, the man of sorrows is shown bearded and wearing the torse, standing in the tomb. Above, two angels hold a mandorla, containing a naked kneeling figure, representing the soul of the Baptist. The bearded head of St. John the Baptist, straight-haired and with a moustache, is represented, mouth open, on a dish. Below, Christ, the Man of Sorrows, bearded and wearing the torse, stands in the tomb; his head is inclined to the left, his right hand rests on the edge of the tomb and the left hangs down in front of it. 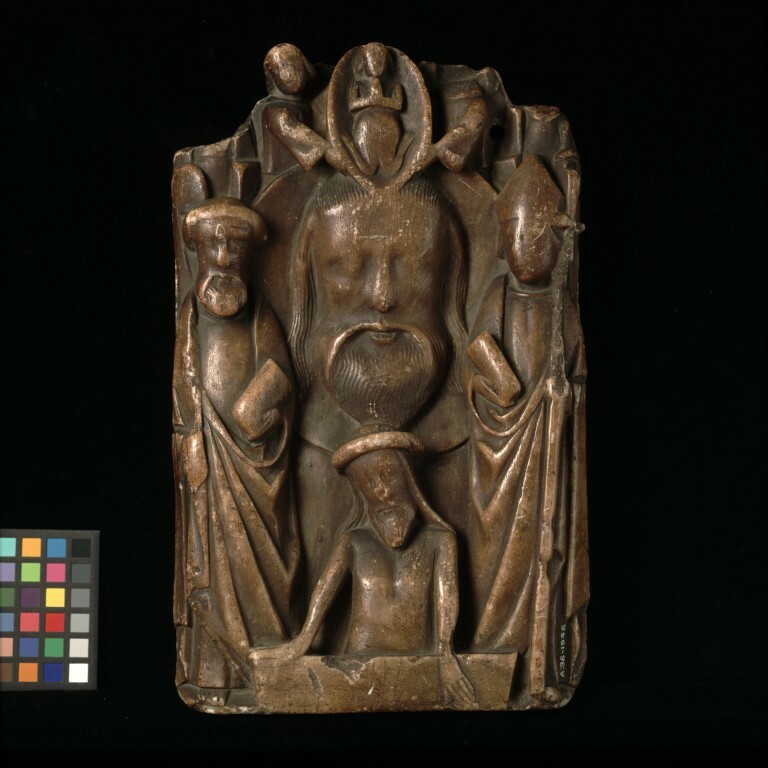 Above, two angels hold a mandorla containing a naked kneeling figure, hands held together in prayer, representing the soul of the Baptist. On the left of the panel stands the bearded and tonsured St. Peter, wearing a robe and a cloak and holding a closed book in his left hand. To the right of the panel stands the mitred figure of an archbishop, probably St. Thomas Becket, wearing a robe and cloak and holding a closed book in his right hand and a cross-staff in his left. The surface of the panel is badly worn. The head of the right-hand angel is missing and the top of the panel is damaged; the top corners, which apparently contained two figures, are missing. The right hand of the figure of St. Peter and the cross-staff of the archbishop are damaged. There is a hole right through the panel above the head of St. Thomas. There is no trace of paint. The panel is stained dark brown. The back of the panel bears three lead-plugged holes. The bottom has been cut away. Acquired by Dr W. L. Hildburgh in Spain, where it was found in a house in Calamocha, a hamlet in the province on Teruel. On loan from Dr Hildburgh since 1922. Given by Dr Hildburgh in1946.